About a month ago I was discussing the approach that I would like to see in introductory Bayesian statistics books. 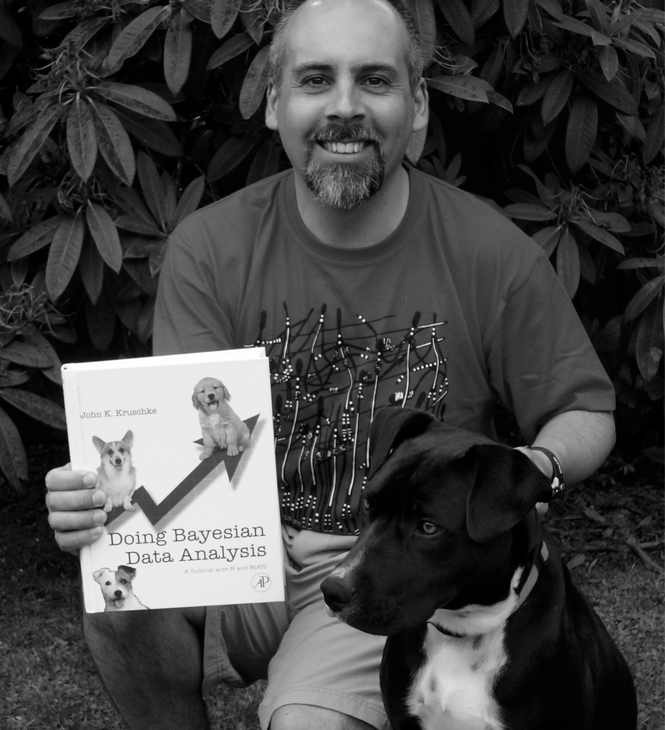 In that post I mentioned a PDF copy of Doing Bayesian Data Analysis by John K. Kruschke and that I have ordered the book. Well, recently a parcel was waiting in my office with a spanking new, real paper copy of the book. A few days are not enough to provide a ‘proper’ review of the book but I would like to discuss my first impressions about the book, as they could be helpful for someone out there. If I were looking for a single word to define the word it would be meaty, not on the “having the flavor or smell of meat” sense of the word as pointed out by Newton, but on the conceptual side. Kruschke has clearly put a lot of thought on how to draw a generic student with little background on the topic to start thinking of statistical concepts. In addition Kruschke clearly loves language and has an interesting, sometimes odd, sense of humor; anyway, Who am I to comment on someone else’s strange sense of humor? 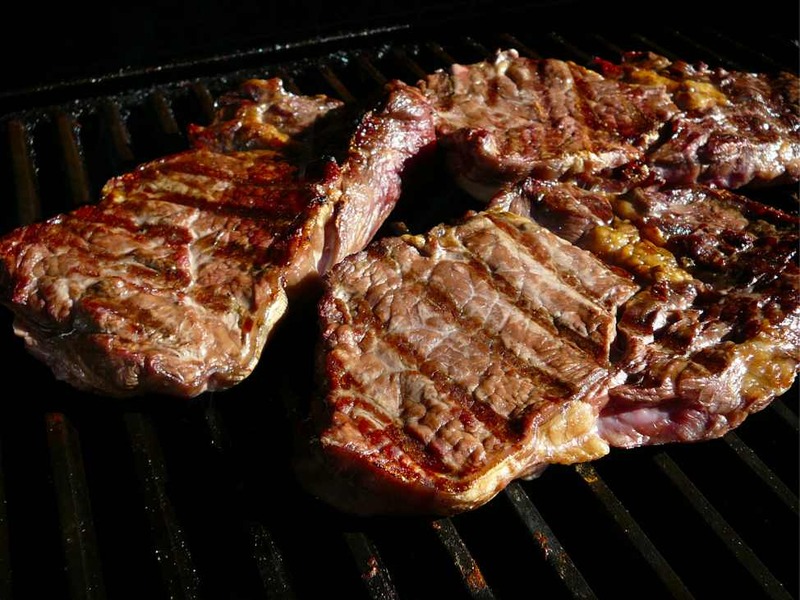 Meaty like a ribeye steak slowly cooked at Quantum Forest's HQ in Christchurch. One difference between the dodgy PDF copy and the actual book is the use of color, three shades of blue, to highlight section headers and graphical content. In general I am not a big fun of lots of colors and contentless pictures as used in modern calculus and physics undergraduate books. In this case, the effect is pleasant and makes browsing and reading the book more accessible. Most graphics really drive a point and support the written material, although there are exceptions in my opinion like some faux 3D graphs (Figure 17.2 and 17.3 under multiple linear regression) that I find somewhat confusing. The book’s website contains PDF versions of the table of contents and chapter 1, which is a good way to whet your appetite. The book covers enough material as to be the sole text for an introductory Bayesian statistics course, either starting from scratch or as a transition from a previous course with a frequentist approach. There are plenty of exercises, a solutions manual and plenty of R code available. Verdict: if you are looking for a really introductory text, this is hands down the best choice. The material goes from the ‘OMG do I need to learn stats?’ level to multiple linear regression, ANOVA, hierarchical models and GLMs. Dear Dr Kruschke, we really bought a copy. Promise! Newton and Luis (Photo: Orlando). P.S. I’m still using a combination of books, including Krushke’s, and Marin and Robert’s for my own learning process. P.S.2 There is a lot to be said about a book that includes puppies on its cover and references to A Prairie Home Companion on its first page (the show is sometimes re-broadcasted down under by Radio New Zealand). I've been using this book as well and really like it. Books which give you hands on tutorials in R are huge for the learning process, although in my opinion Dr Kruschke spends too much time building huge and confusing functions, as well as spending too many lines of code on labeling and arranging graphs. I haven't had a close look at the code (this is just my first impressions) but I totally understand that it could be far from perfect. I'm particularly interested in finding good explanations from the conceptual point of view. Rob Weiss is ver clear and the focus od this class is very applied. He comments on many books. Cheers, Antonio. Thanks for the links Antonio. Many thanks for your kind remarks about the book, and for sharing it with Newton! I hope that the quake of a few days ago didn't cause you troubles. Please feel free to contact me with comments, questions, or suggestions. Thanks again! We had a scary/exciting time: we were in a lookout when cracks came under our feet with puffs of dust: not an everyday occurrence. There wasn't much damage but a sense of '"here we go again…"